I mentioned on Tuesday that I had not one, but two OB appointments this week, and I’m happy to report that baby is still onboard and healthy as can be! You’re probably wondering why I had two OB appointments…In a nutshell, my body hates me. I have two autoimmune diseases, rheumatoid arthritis, and sjogren’s. Both are fairly easy to manage, but in pregnancy sjogren’s can cause problems with the baby’s heart, so I get to see a high-risk OB for extra monitoring. Baby is doing great, and his/her heart looks and sounds beautiful at this stage. We’ll do an EKG at 20ish weeks as an additional precaution, but we’re optimistic that all is well. Camryn, my BIG 3 year old *tear*, never had any issues with her heart in utero, if you’re wondering. We were lucky enough to score some great pictures of baby at my appointment, including the profile view above. We have guesses from one OB about gender, but won’t get confirmation until June 16th. 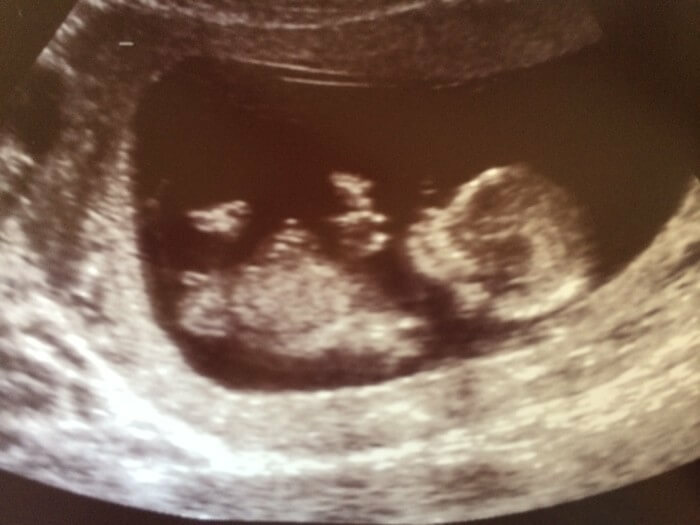 We also got a face view of baby, but it still looks like an alien, so I’ll be sure to share more photos when it gets a little cuter. I’ve managed to gain almost 5lbs despite my constant nausea (seriously, wth?) and my belly has officially outgrown my pre-preggo jeans. I’ve been relying on maxi dresses and skirts on the regular, as well as my bella-bands for days that I feel like attempting to still wear my pre-preggo shorts. I’m feeling quite comfortable in my current wardrobe, and will share some of my first trimester fashion with you soon. I’ve been making my husband snap pics of my outfits often, so I’ll share a compilation of those with you soon. I’ve definitely discovered a few must-have items, like these comfy pajamas, everyday maxi dresses, and lots more! No end in sight for this dreadful nausea, but I’ve been getting to facetime with my very new and adorable nephew lately, and he is a good reminder that it will all be worth it in the end!! For any of you fellow moms-to-be, I did start a B6 regimen of 25mg morning & night, as well as 12.5mg of unisom at bedtime, and it does seem to help. It takes the edge off enough that I’m not throwing up multiple times a day, which is worth mentioning, if you know how awful morning sickness can be. I hope I answered the questions that many of you have been asking me lately, and feel free to leave any other questions for me in the comments, as well as your gender guesses! I’m thinking boy too! Yuck, I remember dealing with the higher risk stuff The good part is that you get to see more of your beautiful baby with all those extra visits! Glad to hear baby is doing well! I can’t wait until you announce the gender and I am dying to see what you’ll choose for the nursery. I love your interior design style! XO I’m still thinking Boy!